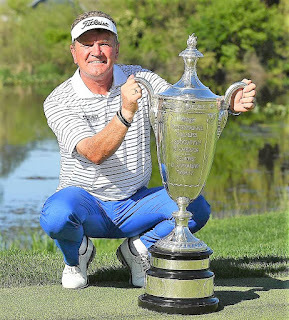 Warwickshire-born Paul Broadhurst became a two-time Senior Major championship winner by dominating play on the final day of the KitchenAid United States Senior PGA Championship. He won the over-50s title by four strokes. This is the 1991 Ryder Cup player's seventh victory since joining the senior ranks, and his second Senior Major after coming from four strokes behind to win the Senior Open at Carnoustie in 2016. The 52-year-old Englishman started the final day at Harbor Shores Golf Club, Michigan two strokes behind joint 54-hole leaders Tim Petrovic and Scott McCarron, and immediately made his move with a birdie on the first hole. Broadhurst drew level at the turn with a birdie on the ninth hole, moving to 15 under par alongside Petrovic. Both reached 16 under par with birdies on the tenth before Broadhurst pulled away with a birdie on the 12th hole. Broadhurst had a two-stroke lead after Petrovic dropped a shot on the 16th hole, and he increased that to three strokes with a birdie on the par three 17th. He then finished in incredible fashion by holing a 40 ft birdie putt on the 18th hole, reaching a joint-championship record low 72-hole total of 19 under par and signing for a tournament-low eight under par 63, one better than his seven under par 64 the previous day. The Englishman started the week with a one over par first round, recovered with a five under par second round and played his final two rounds in 15 under par. Miguel Angel Jiménez finished fifth on 12 under, with fellow Staysure Tour members Colin Montgomerie and Chris Williams a shot further back in sixth place. 2002 Ryder Cup player Phillip Price carded a final round 67 to share eighth place on ten under par. Broadhurst is the second English player in golfing history to win the KitchenAid Senior PGA Championship, following in 2012 winner Roger Chapman's footsteps. Five of the last seven winners have been European: Broadhurst (2018), Chapman (2012), Bernhard Langer (2017), Colin Montgomerie (2014, '15). Paul Broadhurst: “It's obviously up there with the Senior Open. They're the top two. I couldn't choose between the two, they're both equal in my opinion. I just wish I was playing like this on the main tour 20 years ago. “I didn't play too badly the first day, I just didn't make any putts. I just hit a poor shot there on number 14 and made double and that was it, 1-over. I guess you think you're out of the tournament, but when I won the Senior Open in Carnoustie I started with a 75, so you never are out of it. “I was playing catch-up and it was important that I got off to a good start Friday, which I did, birdied three of the first four holes and I managed to continue that good form over the weekend. "It's not very often you shoot 66 on a Friday, bettered it Saturday and then better that on Sunday. So yeah, it's been a special week. “Once I got into the round I started to relax a little bit and it was only, I guess when I finished the front that you, I wouldn't say tense up, but you know you got something to lose now. You're leading the tournament, it's not necessarily yours to lose because you got no control on what Tim or Scott were doing behind, but it felt it was not necessarily mine to lose, but there was something to lose if I hit bad shots. Phillip Price: "I would like to kind of kick on a little bit now and do well in Europe. The tour is looking great at the moment for us, so I'm looking forward to that as well. So it's nice to get off and running, you kind of get your confidence and get ready for a good season. "The Tour starts now. We had a nice tournament in March, but we got a big run of tournaments all the way through, so you want to find your form straight away." Chris Williams: “I putted a lot better today, a little nervous coming in, I got to say, counting the pennies before the tournament's finished. But I played well the whole week, I hit the irons great the whole week and just so excited I did so well in a major. This is the best finish I've had in a major.